What Is a List of Foods Vegetarians Cannot Eat? There are many reasons to pursue a vegetarian diet. Some do it for health reasons; others do it because of religious or ethical convictions, including concerns about the treatment of animals and addition of hormones and antibiotics into the food supply, largely through meat sources. 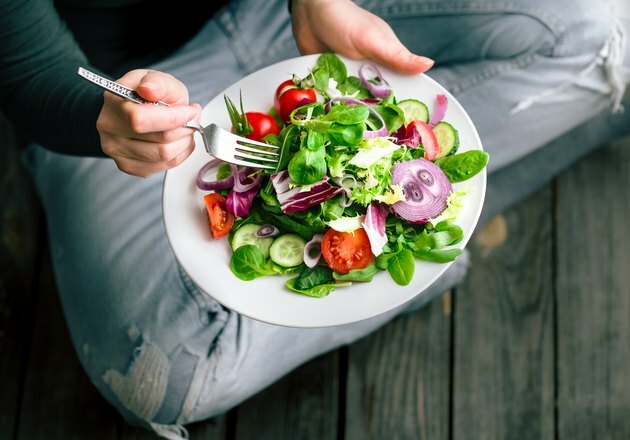 Regardless of your motivations, there are at least three types of vegetarians, each coming with its own short list of foods to avoid, along with a few subcategories that exist on the fringe of vegetarian dietary rules. Lacto-ovo vegetarians avoid all meat products, but eat eggs and dairy. Lacto vegetarians avoid meat and eggs, but eat dairy products. Ovo vegetarians avoid meat and dairy, but will eat eggs. Some would argue that the vegan lifestyle is also a type of vegetarianism. Vegans don't eat any type of product derived from an animal, which includes meat, eggs, dairy, fish and animal "byproducts" like honey and gelatin. Many vegans also eschew nonedible animal byproducts, such as leather. Although they're not always included in discussions of vegetarianism, some groups avoid all animal proteins except for fish or chicken. These are sometimes known as pesco-vegetarians or pescetarians (won't eat meat, will eat fish) or pollo-vegetarian (won't eat red meat, will eat chicken). And finally, the umbrella terms semi-vegetarian or partial vegetarian may be applied to the pesco-vegetarian or pescetarian groups described above. But these terms are also used to describe someone who follows a mostly vegetarian diet, with only occasional forays into the world of animal protein. This type of lifestyle is often used as a way of testing the vegetarian waters, so to speak, or simply living a more conscious or ethical lifestyle. Because the vegetarian diet excludes most or all animal protein, there are a few possible nutrient deficiencies that you should be attentive to. Protein: This is easiest for those who allow themselves limited animal protein, whether it's from eggs, dairy or fish. With that said, UCLA's David Geffen School of Medicine points out that over-reliance on dairy foods and eggs can be a source of concern because of their fat levels. Alternative sources of protein include nonfat or low-fat dairy products; plant-based proteins like soy, quinoa, barley, amaranth, millet and wild rice; nuts and nut butters; and legumes including soy, its byproducts tofu and tempeh, and all varieties of beans. Note that not all sources of plant protein have all the amino acids your body needs, so you need to combine them to create complete proteins — for example, beans and rice. The easiest way to ensure you're getting a full protein profile on a vegetarian diet is to eat a wide variety of protein-rich, plant-based foods. Health.gov's Dietary Guidelines for Americans 2015-2020 recommend a protein intake of 46 g for adult women and 56 g for adult men. Calcium: While lacto-ovo vegetarians and lacto vegetarians typically don't have problems with calcium deficiencies because of their dairy consumption, these can be an issue for other types of vegetarians. The Dietary Guidelines for Americans 2015-2020 recommend a daily calcium intake of 1,000 mg to 1,200 mg for adult men and women. Vitamin B-12: Vitamin B-12 comes only from animal sources. So a B-12 supplement is among the most important vitamins for vegetarians (including vegans) who follow a strict diet with little or no animal products. Some foods, such as bread, cereal and soy milk, may be fortified with added B-12. The recommended daily intake of vitamin B-12 is 2.4 micrograms. Vitamin D: The vegan diet also tends to be quite low in vitamin D, although soy milk and breakfast foods may be fortified with additional vitamin D. You can also use that as an excuse to spend time in the sun, which allows your body to create its own vitamin D.
Health.gov's recommended daily intake of vitamin D is 600 IU. Zinc: This is another mineral that vegans may find themselves struggling to get enough of, because its bioavailability tends to be poorer in plant foods. According to the Dietary Guidelines for Americans 2015-2020, the recommended daily intake of zinc is 8 mg/day for women and 11 mg/day for men.